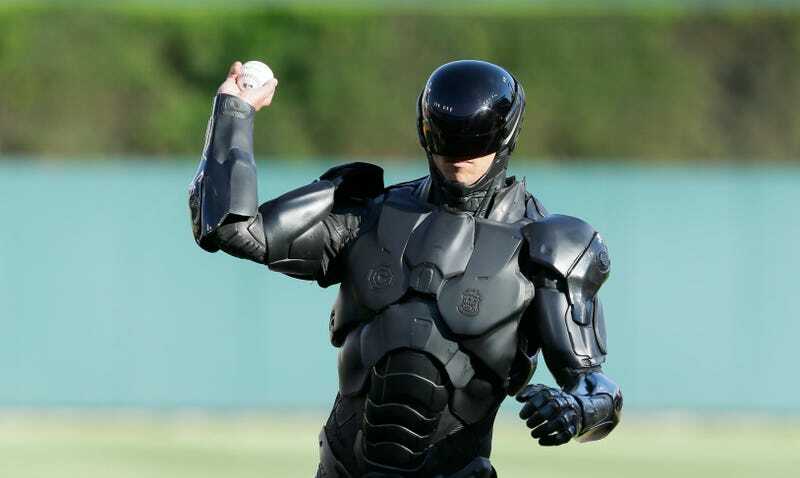 RoboCop Day was all day in Detroit yesterday — a success in some aspects, a disaster in others — and concluded with the crimefighter tossing out the first pitch at the Tigers-Blue Jays game last night. And it was awful. Maybe not 50 Cent bad but we expected a little more. Watch below. You may have heard in the news today that the RoboCop statue was being unveiled in Detroit today. This was news to us! And not true news. To be clear: the RoboCop statue is still on track to be finished later this year, and is still in the hands of Giorgio Gikas at Venus Bronze Works in Detroit, but news reports about it being unveiled today are incorrect. Perhaps the miscommunication grew from the misreporting of an MGM promotion for the new RoboCop DVD where a person in a RoboCop outfit is walking around Detroit and throwing out the first pitch at the Tigers game tonight. All official updates will come through this page. Thank you for your cooperation, and Go Tigers!